French folks like to refer to their country as the Hexagon (l'hexagone), easily associated to the geometric, geographic shape of the land. They are, in fact, quite proud of this and refer to it quite often as though this is either clever, or at least, quite fashionable. In any case, as of October, and after 2.5 years of casual, travel when I can, exploration, I finally completed a trip where I can now say I have touched each of the six points. Oct07 - Pays Basque, Biarritz, St-Jean du Luz, Bilbao-Espagne. If you go up in the Pyrenées mountains you can find a lot of sheep, and those sheep provide a nice supply of milk that ends up in brebi cheese. Add a light sauce from local cherries, and accompany with a glass of very nice Irouleguy red wine. All very complementary and enjoyable. This comes from a region of the country where the local language, Basque, is one of only 3 languages in Europe that does not descend from the vast indo-European family of languages. Apparently, doesn't mix well with french or spanish. Lack of communication sometimes results in bomb-making. Oct07 - Banyuls-sur-Mèr. A little spit of land on the Mediterranean coast, all the way in the southwestern corner of France, just next to Spain. A beautiful landscape of very steep hills completely covered with grape vines and stone, overlooking the Mediteranean Sea on a beautiful sunny week-end in October, long after the large majority of tourists have departed until their return next summer. Hills steep enough that you can only imagine goats would be happy on these hillsides. Having said that, the Romans planted the first wine grapes here, and after about 3, 000 years of practice of working these hillsides, vine by vine, all by hand in between small hand built dry-laid stone walls to stabilize the steep slopes, they turn out a rather nice desert wine, and an ever-increasingly reputable series of red wines that recall the Order of Templars that used to hide out in this part of the country. Practice often makes plenty good enough. Every week has 4 1/2 days. Apr05 - Nice, Antibes, Mediterranean coast near Monaco and Italy. First experience I had with recognition that the rhythm of life here is completely different than the US. Lunchtime is lunchtime; dinner is later; in between - well, too bad you missed lunch. Tues the museums close, as well as Sun afternoon, and well if Monday is a holiday, why not close all the basic tourist attractions for a three-day week-end. It can be that way. There is no 24-hr Walgreen's or Kroger's. Get your work done during the work day, plan ahead for the time off, no one else works just because that is a convenient time for you to shop or visit. The other 2 1/2 days, you might as well enjoy with family and friends and with whatever supplies you have on hand. Dec05 - Strasbourg. In the face of a true architectural marvel of a 15th century cathedral, sipping hot spiced wine in the Marché Noël crisp winter air after having enjoyed a traditional choucroute (sauerkraut) dinner in a restaurant that has been in business for about 400 years, you can reflect on the fact that the soil here has changed owners and languages every hundred years or so for several hundreds of years. French, German, French, German, loves-me .. loves-me-not. My great-grand parents exited from Alsace-Lorraine in the late 19th century in the face of conscription into the German army for my great-grandfather. He decided chances were better in the USA. Spoke German; came from France. Strong signs of non-french-y influences everywhere. Napoléan decreed that French would be the spoken language in his France; Austria marched into Paris on his watch. Beer, sauerkraut and auld-long-syne all around. Static is nowhere ... today in france, there is the basque country, return of the language Bretagne-ic, and significant immigration from Africa. We all need to update our definitions of ourselves on a continuing basis, or speak Latin, I guess. Sep07 -Lille. I drank a few (hundred) beers in the US. Love a good IPA or pale ale. Traveled all around France; always heard talk of Belgian beers as the finest. Went to Lille; hooked up with a group of americans in search of the finest; sampled a few (tens) of the finest northern france/belgian beers that the connoisseurs could barrel up. Give me Snake Dog from Flying Dog or a Commodore Perry from Great Lakes, or just the next IPA off the shelf at Dutch's Pony Keg any day of the week. Never question that the new school can beat old school at it's own game. Nov06 - Bretagne, La Forêt de Brocéliande. I didn't make it all the way out to the point at Brest, but nevertheless, had a nice long Thanksgiving week-end '06 to explore a nice portion of Bretagne. Deep in the center, from the heart of the country that brought us the Knights of the Round Table, chivalry, and Merlin, (yes, from France - see point #4) if you have the fortune to follow a mysterious trail deep in a an enchanted forest, you can collect some water from a spring that marks the location where Merlin met the mysterious Lady of the Lake and persuaded her to give the magical sword Excalibur to King Arthur. Today, it is said that the water from the fountain provides some mental health stability. Worth a try, after having traversed l'Hexagone and lived in France for 2 years. I have drunk from the fountain; I feel all the better for having done so. When I was a kid, I went to a school called Our Lady of Lourdes for about six or seven years. We had a grotto out front of the building with a staute of Mary in it, and every year, one afternoon in May for about an hour, we had a religious ceremony of some sort (I seem to have forgotten the details) where I presume we commemorated some sanctity characteristics of Mary the Virgin, and also Bernadette the young woman who had visions and the shakes associated with close encounters of the religious kind in a cave just outside of Lourdes, France. So, obviously, in heading south and west in France, I was drawn to Lourdes like a little catholic boy to recess. Drove until it was time to quit for the day; found an interesting chambre d'hôte about 20km from Lourdes in a hamlet called Saint-Pé-de-Bigorre. For the evening, we had dinner with two couples, one French, one South African. The French couple, who lives near Paris, was visiting the husband's hometown, where he had in fact been enrolled in the seminary as a teenager, but thought better of the situation; left; ended up working for an international construction company and lived most of his life in Asia, Africa, and the Mid-East; married a delightful woman with whom he had a few daughters. Said he didn't regret leaving the seminary. The S. Africans were visiting some family in France for a cousin's 60th birthday party and couldn't really get the french concept of terroir (i.e., why Champagne comes only from Champagne, why Roquefort only comes from Roquefort, and, god love us, why Bourbon only comes from gen-u-wine Kentucky sour mash). At any rate, made for some lively and interesting 5-course dinner discussion in a several-hundred-year-old farm house, around the corner from the seminary, in view of the Pyrénées mountains, not that far from Lourdes. Went to Lourdes in the morning. There is a lot of opportunities there to purchase rosaries, statues, candles, Jesus bracelets, Mary necklaces, Bernadette postcards, and water bottles. A lot of opportunities. Really. It's transcendantal. Hundreds of little shops in the ville, all with the soul intention of selling you some sort of religious artifact with which you can cherish and mark your moments spent in Lourdes, a place of miracles in the 19th century. I will say this... walk past the tourist shops (OK, pick up a rosary or two if you like), continue on past the 20th century model of a 18th century gaudy Romanesque sort of church/cathedral and you eventually end up at the spit of land associated with the miralces of Bernadette and Mary. Hallowed ground. And for me, I will also say this ... a sense of calm, order and peacefullness reigns at the shrine. Truly. It was very pleasant. I didn't see any miracles. 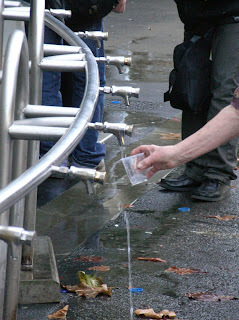 I did see groups of people who had traveled from Eastern Europe in buses to pray together, a group from Hawaii on a 'greatest religious sites in France' sort of tour, and just regular folks, likely from all over the world, lining up at the water fountains, saying some simple prayers, perhaps hoping for a miracle, but more likely perhaps just looking for some minutes of peace and calmness, and a forget-everything-else for a few minutes sort of tranquility. 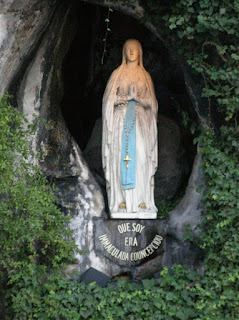 You can find that there, next to the water fountains, just a few meters from the real grotto, in which, of course, there is a statue of Mary. I lit a candle for Mom. She would have liked that. As she always said: "You never know." 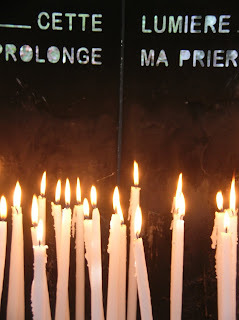 The sign next to the candle says: "This flame continues my prayer." I like to think the candle is still burning. Oh yeah, just so I don't forget ... the Pope (the current one, Benoit XVI) has committed to going to Lourdes in the fall of 2008 to commemorate the 150th anniversary of the visons that Bernadette had of the Virgin Mary near Lourdes. Tourism and Religion and the Pope. Should be something.